If you've ever had a nightmare about bombing in a musical performance onstage (and who hasn't? ), then Drop A Beat, Giuseppe! is for you. 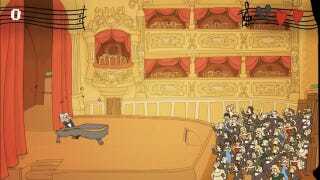 The free flash game puts you in control of Giuseppe, a misunderstood piano genius. His audience is angry, and in order to survive, you have to move your piano underneath the trash they throw and kick up the piano-lid to toss it back. The twist is that in order to move, you must mash your fingers all over your keyboard somewhat like a brilliant pianist. As you do so, Giuseppe will move: He'll go to the left if you bash the "low" keys, and to the right if you play the "treble." The whole thing is funny in that way that creatively imprecise games can be. It was created by Molkman and MajusArts, and in their author comments, they say it took them about 32 hours. That'll do, Giuseppe.